This extensive Switzerland train tour starts in Lucerne, the heart of Switzerland, then takes you to the Italian speaking Lugano and via the Bernina Express scenic train to St. Moritz in the Engadin. Next you will transfer on the famous Glacier Express Route to Zermatt to see the Matterhorn. After a short stay in Montreux you continue with the Golden Pass train to Interlaken for an excursion up to Mt. Jungfrau (Top of Europe). Your tour ends with a night in Zurich. These vacation packages in Switzerland include all rail transportation, overnights in 3 or 4-star hotels with breakfast, seat reservations on Bernina Express, Glacier Express and Golden Pass as well the excursion to Mt. Jungfrau and Matterhorn Glacier Paradise. You don't want to miss one of the best train trips in Switzerland! Our vacation packages in Switzerland begin with an arrival in Lucerne by train 2nd class from the Swiss border or airport. Overnight in Lucerne. Full day at leisure in Lucerne. Overnight in Lucerne. From Lucerne the train takes you to the mountain monastery village Engelberg where you board a gondola which takes you up to the Trübsee. You continue your trip by another gondola to Stand and finally the first revolving Titlis Rotair cablecar takes you up to Mount Titlis. Visit the glacier cave and ride the Ice Flyer chairlift. A trip by boat, Cogwheel railway and Aerial Cable-way operating from mid-May to mid-October 2019. Queen of the mountains with a view over 13 lakes and 360° panorama. 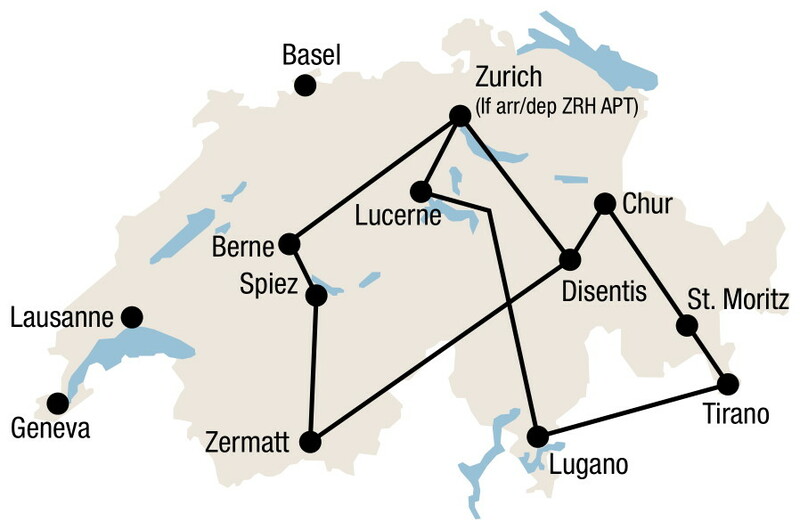 The best train trips in Switzerland continue with a journey from Lucerne to Lugano. Experience the new Gotthard Base Tunnel – with 57 kilometres it is the longest train tunnel in the world. It takes only 17 minutes to travel this fast flat-track route under the Alpine massif in the heart of Europe. Overnight in Lugano. The Bernina Express of the Rhaetian Railway takes you along the UNESCO World Heritage route. The vacation packages in Switzerland include an Alpine switchback ride, taking you from a land of swaying palms to one of towering glaciers. Overnight in St. Moritz. Today you board the Glacier Express which is one of the best train trips in Switzerland and the world. You travel from St.Moritz to Zermatt. An 8 hour railway journey across 291 bridges, through 91 tunnels and across the Oberalp Pass at 2’033 metres in altitude. Travel in comfort through the unspoilt natural beauty of a landscape rich in ancient, fragrant mountain forests, peaceful Alpine meadows, rushing mountain streams and mountain valleys, soaked in tradition and centuries-old culture. Optional lunch – if required, please indicate on the booking request. Overnight in Zermatt. The Zermatt Bergbahnen AG takes you up to the Matterhorn Glacier Paradise which is Europe's highest cable car station at 3883 m. The 360° panorama is unique and many highlights are waiting for you to be discovered: Snow-Tubing, Cinema Lounge, Glacier palace, Peak Shop, Viewing platform. Overnight in Zermatt. The vacation packages in Switzerland include a wonderful rail journey through the Valais which is well known for its excellent wines to Montreux on the shore of Lake Geneva in the French part of Switzerland. Overnight in Montreux. From Montreux take the GoldenPass Line to Zweisimmen. You will find yourself among alpine forests, bubbling mountain springs and picturesque mountain villages. In Zweisimmen you change train to Interlaken. Possibility to stop in Gstaad for an excursion to Glacier 3000. Overnight in Interlaken. The journey to the Jungfraujoch – Top of Europe at 3454 metres is Europe’s highest altitude railway station and a highlight of your visit in Switzerland. It offers visitors a high-Alpine wonderland of ice, snow and rock, which can be marvelled at from vantage terraces, the Aletsch Glacier or in the Ice Palace. Overnight in Interlaken. Take the best train trips in Switzerland to get to the lakeside discovery metropolis Zurich and enjoy some time at leisure. Overnight in Zurich. Swiss Transfer Ticket Combi: Best of Switzerland (8 transfers) in 2nd class from/to Swiss border or airport. Seat reservation for Bernina Express (coach and train), Glacier Express, GoldenPassLine Montreux–Interlaken. Excursion to Matterhorn glacier paradise incl. Glacier palace. 2 nights each in Lucerne, Zermatt + Interlaken, standard room with private facilities, breakfast. 1 night each in Lugano, St. Moritz, Montreux, Zurich, standard room with private facilities, breakfast. A coffee and a croissant will be served on board the Chocolate Train. The «La Maison du Gruyère» awaits you for a visit of the demonstration cheese factory. Afterwards a bus takes you to the village of Gruyères for some leisure time. You might go for lunch and enjoy the tasty local cheese fondue or visit the Gruyères castle. Later that afternoon the Chocolate Train takes you to «Maison Cailler-Nestlé». Trough a didactic itinerary, you will learn everything about the history of Swiss chocolate making tradition followed by a chocolate tasting. Afterwards return travel to Montreux.